First, guided by a hidden mastermind, "Hands in the Dark" deliver sudden death, and the only clue is a blood-red message left by a dead man! 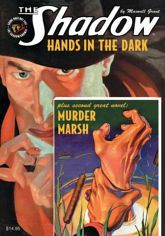 Then, as scientists seek an exotic plant and crooks hunt ill-gotten wealth, The Shadow stalks death itself in the haunted "Murder Marsh." This instant collector's item showcases both original color pulp covers by George Rozen, classic interior illustrations by Tom Lovell, and historical commentary by popular culture historian Will Murray.